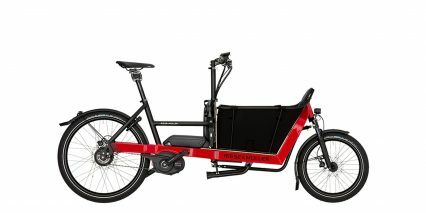 The Culture is a full suspension urban electric bike model introduced to North America for the 2019 season. 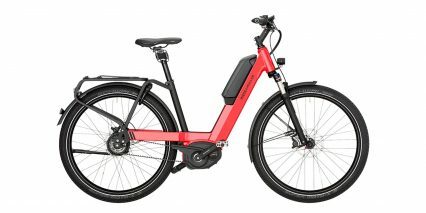 It’s slightly specced down from the Homage model, so the price is lower but it doesn’t offer high speed motor options or Rohloff hub drivetrain choice. 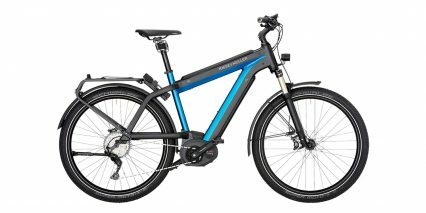 Instead, you get to choose between a Shimano 11-speed cassette derailleur or continuously variable planetary transmission called Enviolo (formerly NuVinci). 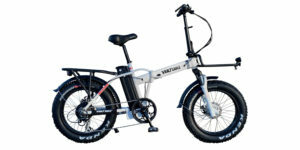 That’s I looked at in this review, and the model name is GT Vario. 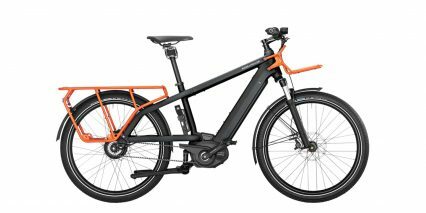 This bike would make for an excellent commuting platform because of the comfortable suspension, upright and swept back handlebar, sturdy overall build (which Riese & Müller are known for), and tough drivetrain. 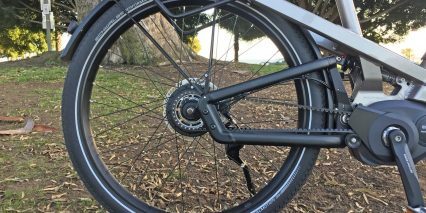 With a Gates Carbon belt drive, the bike pedals quietly and won’t require as much maintenance. 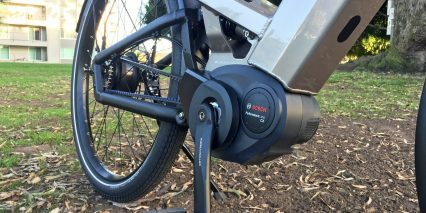 You can shift at standstill, and even though the Bosch Performance Line CX motor offers shift detection, it’s not really necessary on a CVP hub. 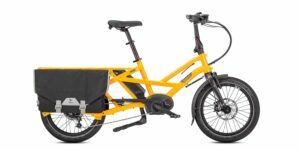 Priced between $5.7k and $6.3k, it’s not the most affordable ebike on the block, but it does come in three frame sizes and offer a lot of utility. Before I list out some of the highlights, take note that all of the hardware on this bike is name-brand. I didn’t see any components or accessories that felt like a compromise… and that means they should perform better and last longer. The Schwalbe tires offer puncture protection and reflective sidewalls, integrated Busch & Müller lights with side cutouts for maximum visibility, extra-wide reinforced fenders that don’t rattle, large hydraulic disc brakes from Magura with adjustable levers, custom suspended rear rack with adjustable rubber straps, custom front basket with bungee loops, Selle Royale gel saddle, locking Ergonomic grips, keyed-alike ABUS alarm lock, and Pletscher Comp 40 kickstand. 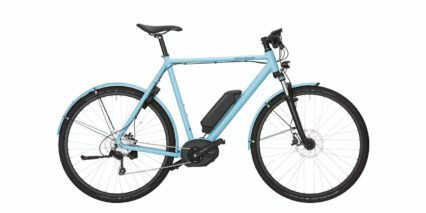 Weighing in at ~71lbs, I’d consider the bike heavier than average, but want to point out how sturdy the wheels are (the front wheel is attached with a 15mm thru-axle which you’d normally find on a mountain bike), and mention that the Enviolo hub weighs 3+lbs more than the cassette option. 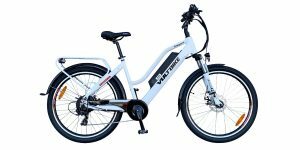 You add in the 3lb alarm lock, front basket, and integrated PowerTube battery and things start to click. 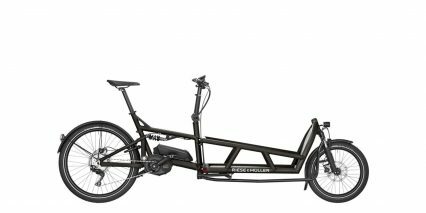 The extra weight isn’t such an issue when you’ve got a high-torque motor and powerful disc brakes. This package was designed from the ground up to deliver reliable transportation. 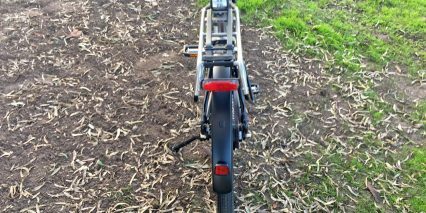 The wheels remain in contact with the ground, thanks to the suspension, and your body is positioned upright. It’s easy to look around and spot traffic or chat with a friend. 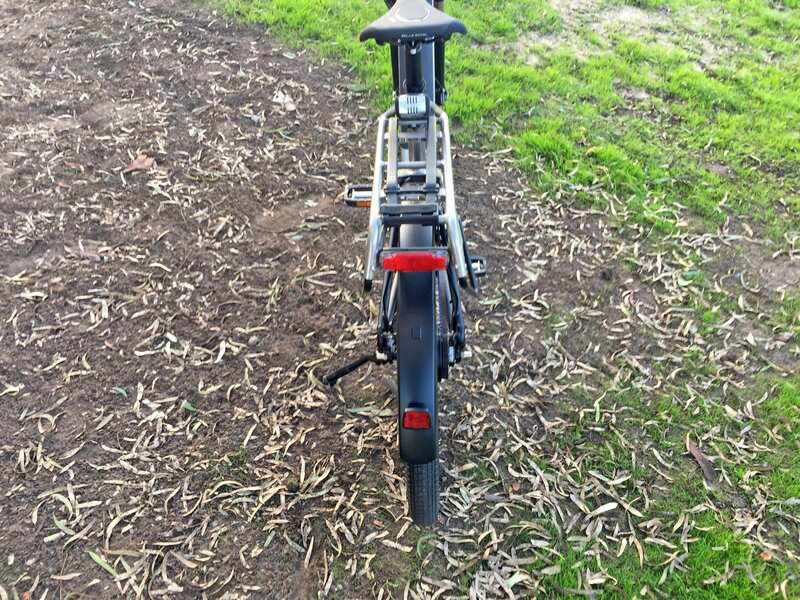 Look at the stem angling up and how the bars sweep back. 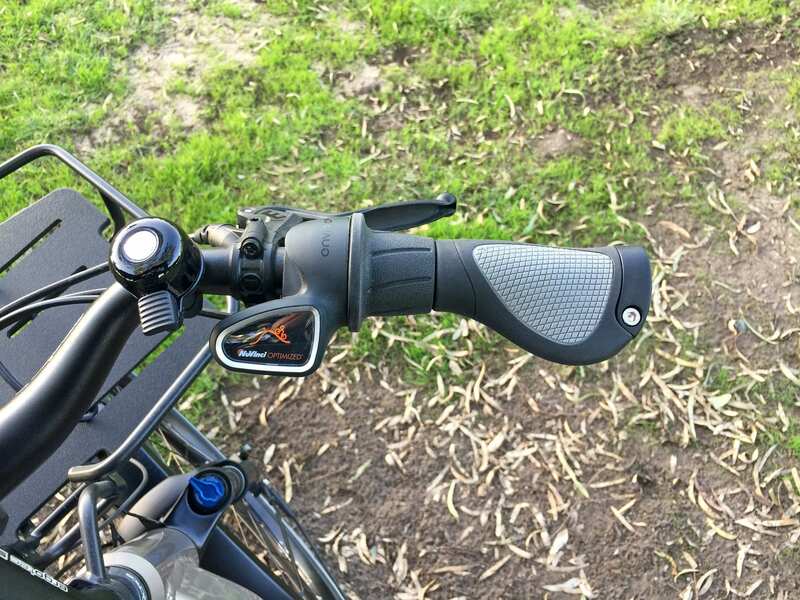 Even mounting the bike is comfortable, the deep step-thru frame requires less hip and knee flexibility to approach, and that’s important if you’ve got a child seat on the back. Many times, frames like this suffer from flex and wobble because they aren’t reinforced well enough, but that’s not the case here. If you’re in a position to spend the money and can weight 1-3 months for the build and ship time, this is an excellent product. Still, consider the Homage if you want a faster motor or the Nevo if you need to save some money and are okay with a hardtail vs. full suspension. The Culture is only available in one frame color, for now, but it’s highly visible metallic silver that would work for all genders. 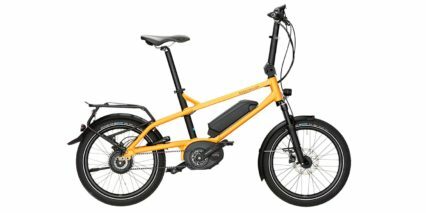 With most of the drive system weight positioned low and center, and a rear rack that’s sprung. I liken the bike to a luxury sedan. 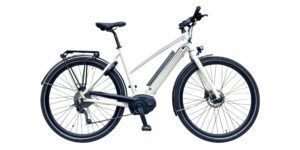 Riese & Müller have chosen to work exclusively with Bosch for their battery and drive systems, at the time of this review. For the Culture line, you only have access to the high torque Performance Line CX motor (offering up to 75 newton meters of torque). 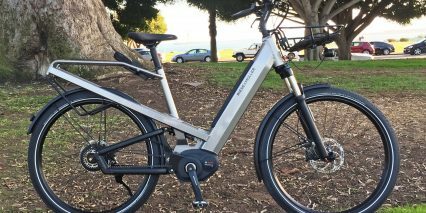 Using a Class 1 20mph drive system means that this ebike will be allowed on the widest variety of bike paths and even dirt trails. 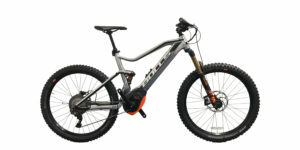 It’s a very popular motor for e-mountain bikes for this reason, and delivers a unique eMTB mode that replaces Sport on all of the other Bosch motors. 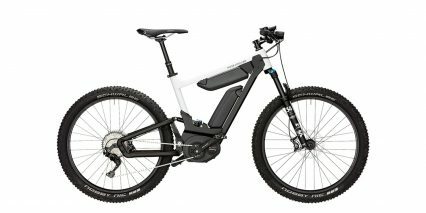 With eMTB, power output relates closely to pedal torque, offering a range of slow and soft to fast and powerful as you pedal… so you don’t have to click up or down through the four assist levels as actively as terrain changes. 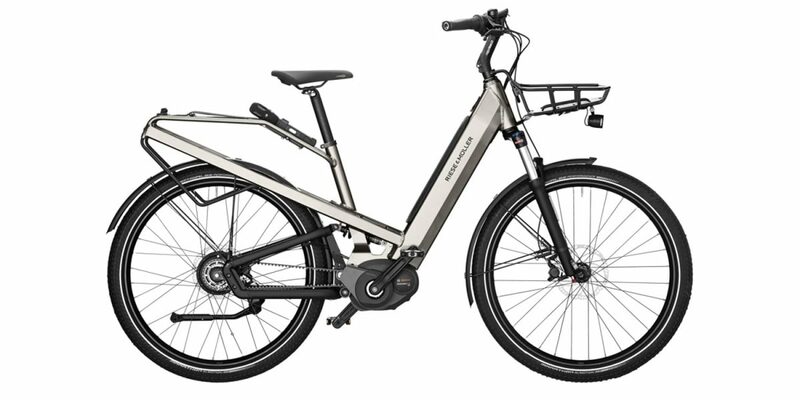 Personally, I enjoy the high-speed performance of the Bosch Speed motor when commuting longer distances because it allows me to keep up with city traffic, but it will drain the battery faster and might be unnecessary if you’re carrying gear or using a child seat on the rear rack. Again, you can get the speed motor on other R&M models, like the Homage. I often comment on frame flex, or complain about the jittery feel and noise produced by cheap accessories, but none of that was an issue here. Hopefully you can see for yourself in the video review above when I go off curbs and through grass, during the ride tests. 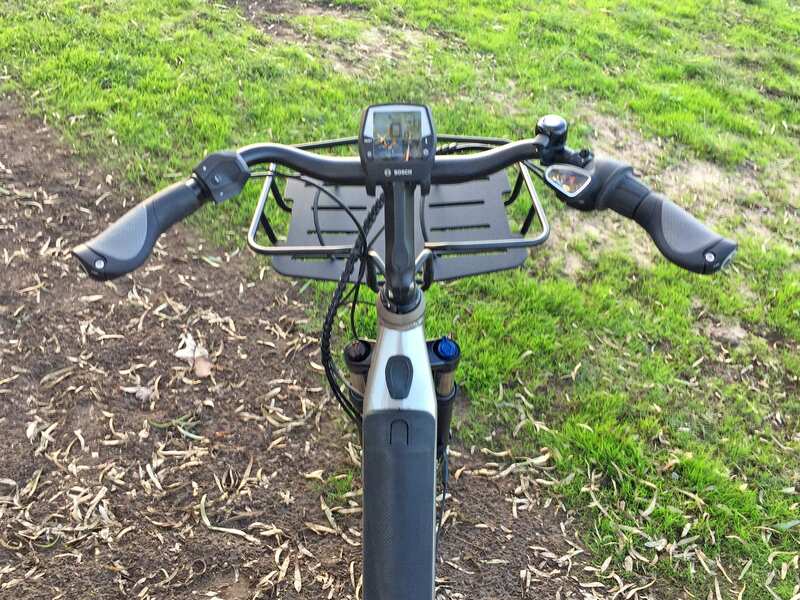 To optimize range, I usually ride in the two lower levels of assist (Eco and Tour), and rely on the drivetrain for comfortable pedal options. 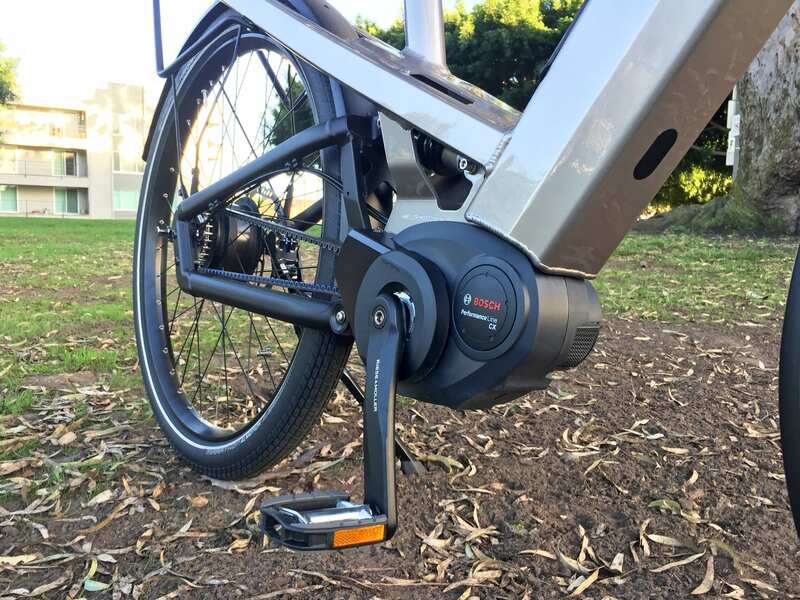 The Enviolo SE is designed to handle higher torque than the standard Enviolo, up to 75 newton meters, and that matches the Bosch CX peak output perfectly. Being able to shift gears at standstill and not worry about gear mashing is nice. 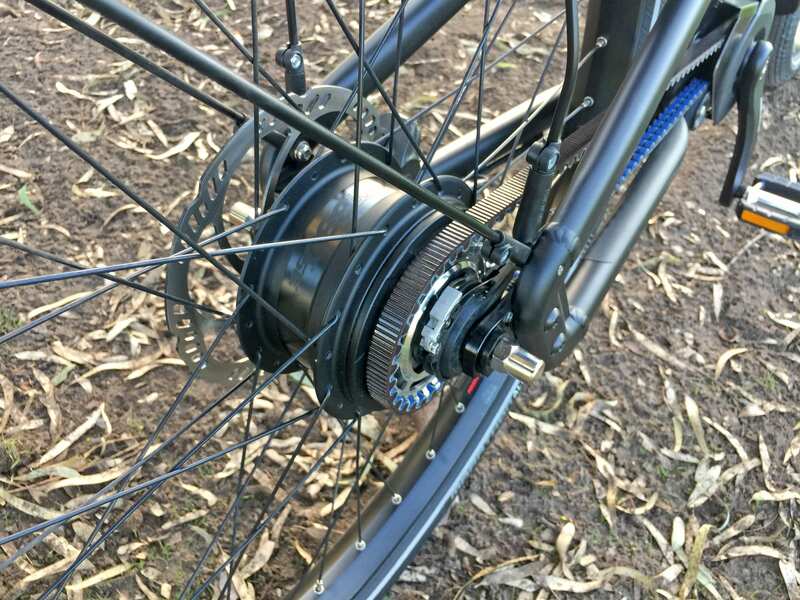 This drivetrain is internally tough and externally protected because there’s no derailleur hanging down off of the side… just a single chainring, a single cog at the rear, and a reliable belt in between. 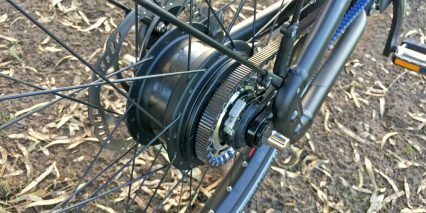 The Enviolo offers 380-degrees of gear range, which is roughly equivalent to an 11-42 tooth cassette. 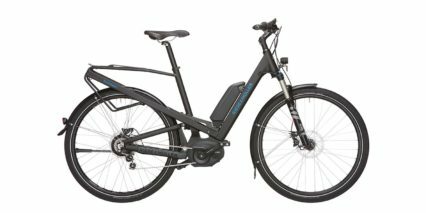 That’s plenty for 0-20mph riding, even climbing steeper hills, and the Bosch Intuvia display offers shift recommendation to guide new users for optimal pedaling and motor performance. 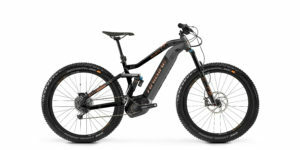 Anyway, the motor controller measures rear wheel speed, pedal cadence, and pedal torque over 1,000 times per second. 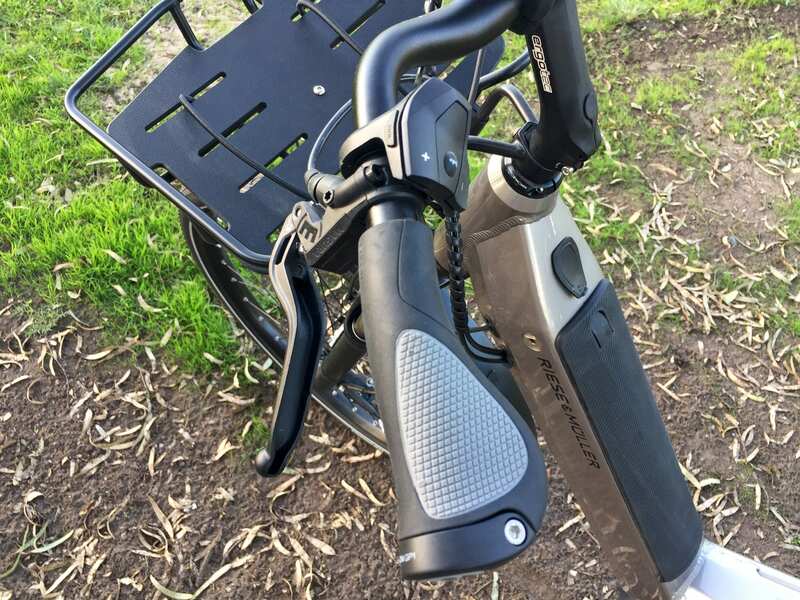 It’s incredibly responsive, de-activating almost instantly when pedal pressure is reduced or pedaling motion is stopped. The motor spins a smaller proprietary chainring (26 tooth in this case) that rotates 2.5x for each crank revolution, it’s a 65 tooth equivalent. My guess is that Bosch designed their motor this way to provide a mechanical advantage and reduce delay time in starting and stopping. It’s one of my favorites, but does produce more noise at high pedal speeds, and some drag when unpowered. 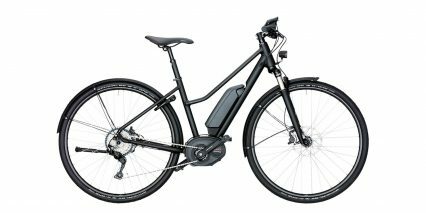 With Bosch, my experience is that you’re getting reliability and performance, but a bit more weight. 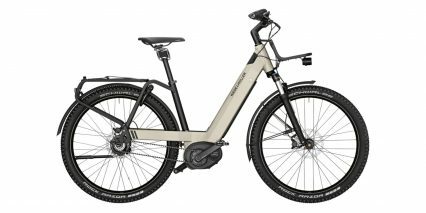 And, the visual appearance of the Performance Line motors on the Nevo, Culture, and Homage, and many R&M models, is less refined that Haibike, Bulls, and some others, who have tilted the motor up to blend into the frame. 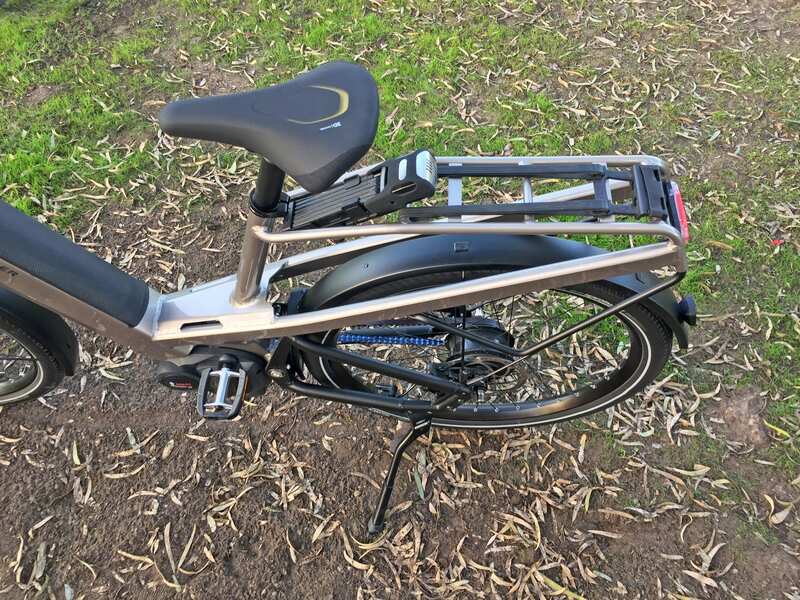 My guess is that this would have compromised frame integrity on this full-suspension bike design or made it difficult to fit a belt drive or the internal battery… but perhaps we will see refinements over time. I do want to point out the little cover, which protects pants and dress ends from the belt and chainring. 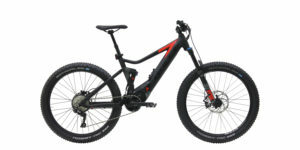 One final note, the motor can support 120 RPM output, so you you can downshift and spin when approaching and ascending hills without losing support, as is the case with some of the down specced Bosch Active Line motors. 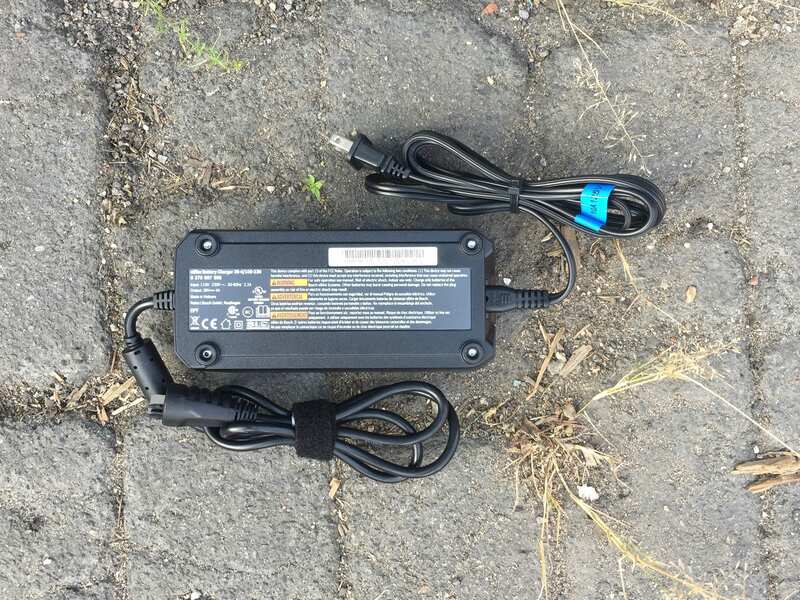 Powering the motor, integrated lights, backlit display panel, and any accessories you plug into the Micro-USB port on the side of the display, is a 482.4 watt hour battery pack from Bosch. 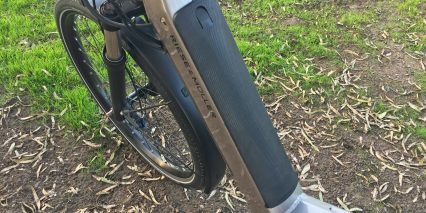 The PowerTube 500 is designed to fit inside the downtube, and it seats from above on the Culture, making it easier to access and remove, in my experience. It’s a neat design choice, because it keeps standover height low and positions weight exactly where you’d want it for optimal balance and handling. 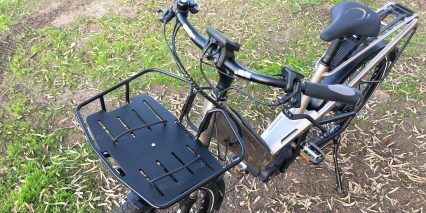 You can charge the pack while seated or separately from the bike, and this is wonderful if you don’t have access to a plug wherever you park the bike. It also allows you to protect the lithium-ion cells inside from extreme heat and cold, which can be damaging to batteries. 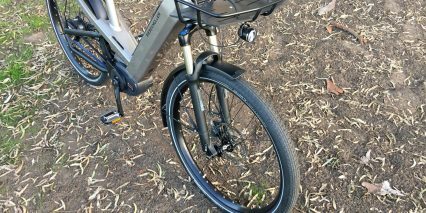 Charging happens quickly here, thanks to the faster 4 amp Bosch charger, yet it’s relatively compact and lightweight compared to others on the market. 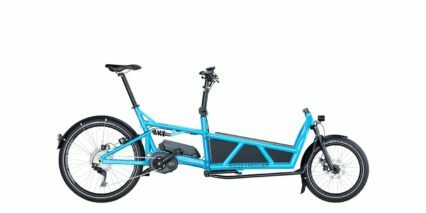 Given the heavier weight of the Culture’s aluminum alloy frame, tires, and suspension elements; I’d probably take one or both battery packs off before lifting and transporting the bike. It’s worth highlighting that the battery pack and ABUS folding alarm lock utilize the same key, so you won’t have to waste time and space with three similar looking keys. In closing, the PowerTube battery weighs more than the older PowerPack (external battery from Bosch), but won’t get kicked as easily. 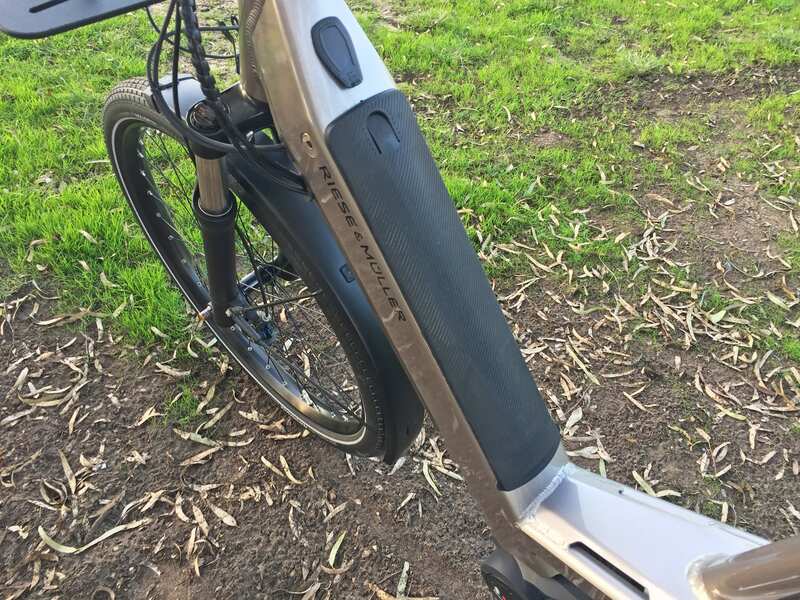 I love the way it makes the bike look, almost non-ebike, and appreciate the rubberized cover which protects the downtube from scratches when mounting and dismounting. 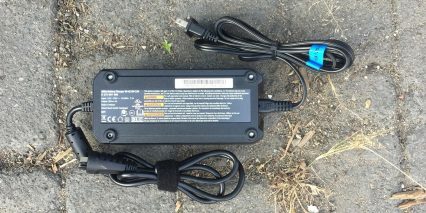 In closing, the PowerTube battery still has an LED charge level indicator built into the casing, so you can quickly see how full it is, and Bosch has a reputation for supporting their hardware for 10+ years and offering cross compatibility. This is one of the more sensitive and expensive parts of the bike, so it’s reassuring to have a 2+ year warranty and dealer support. It’s part of what you’re paying extra for, and it’s a good design. 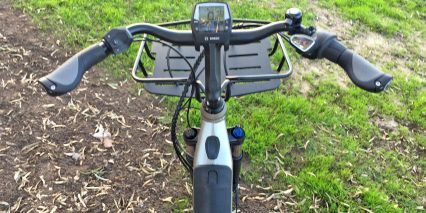 Operating this bike is very intuitive display panel and control pad. 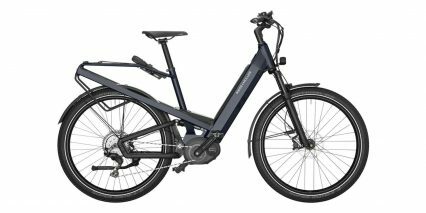 Once the battery or batteries are charged and connected to the frame, you simply press the power button on the Bosch Intuvia display panel, and it quickly loads some menus. The main dashboard shows bike speed, battery level (a five bar indicator), chosen level of assist (four levels) and a power meter to the right. Along the bottom, a rotating menu shows trip stats including max speed, average speed, clock, trip distance, clock, and dynamic range estimate (that changes as you select different assist levels). You can cycle through these menus using the i button on the display and also on the button pad mounted near the left grip. 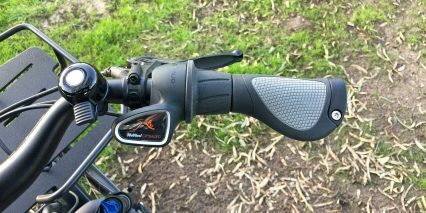 You really only need that i button and the up/down arrows on the control pad to use the bike once it’s switched on, and they produce a satisfying tactile click that helps you understand what’s happening, even if you can’t look down while riding. You slide through gear ratios (since technically there are no gears) using a half-grip twist shifter on the right. 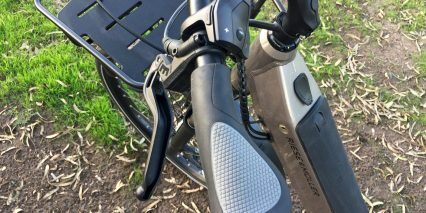 Given the potential power of the Bosch CX motor, I found shifting to be most efficient and comfortable when done as I eased off of the pedals a bit (which decreases motor output). I already mentioned the integrated Mini-USB port, great for maintaining smartphones for GPS or music on the go, and I want to call out the always-on white backlighting of the Intuvia LCD. It’s convenient in the dark, but can sometimes feel a bit bright and distracting. There’s also a walk mode, which is accessible if you are in one of the four assist levels and press the button on the top edge of the control pad and then hold +. This activates the motor very slowly, to help you push through grass or limp home if the tire goes flat. 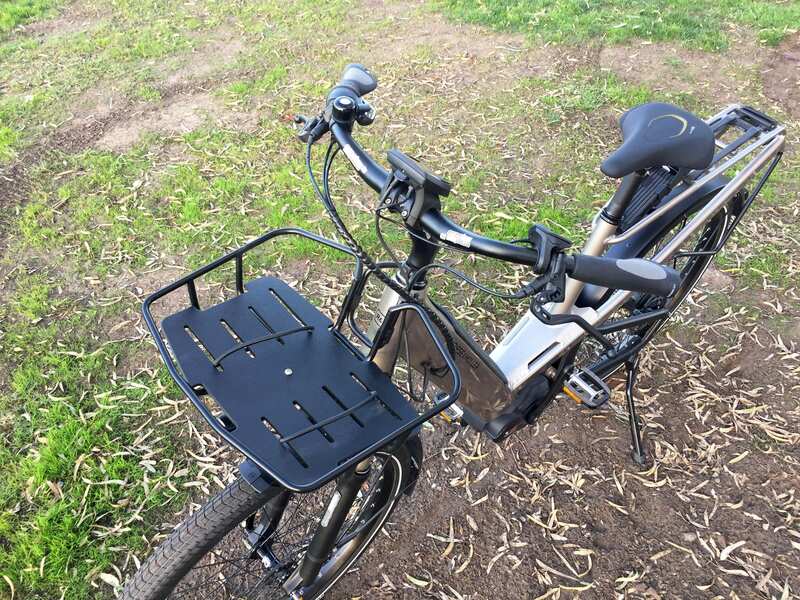 It’s very handy if the rear rack does have cargo or a small child mounted. 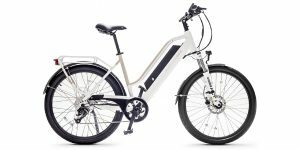 In closing, the Intuvia display panel delivers almost everything I have grown to know and appreciate in the world of ebikes. It’s removable, easy to read, full of useful features but not too complicated… I just wish it showed battery percentage in addition to or in place of the basic five bar infographic. 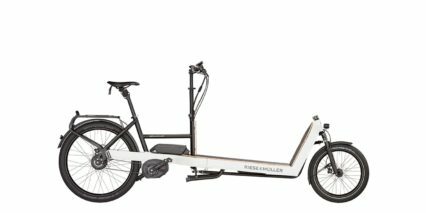 It’s nice to have another option in the Riese & Müller lineup, because they produce such unique and high quality products. The Culture wasn’t as affordable as I had guessed, but they really didn’t compromise on components and features here. 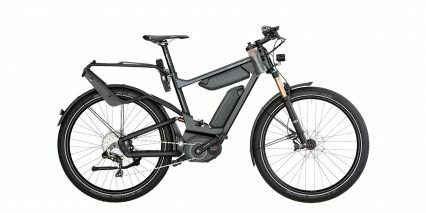 You don’t get the speed motor as a drive system option, you can’t get a second battery like you can on the Homage, the lights are stepped down from Supernova to Busch & Müller, and the suspension is spring vs. air, but otherwise… they are very similar products. 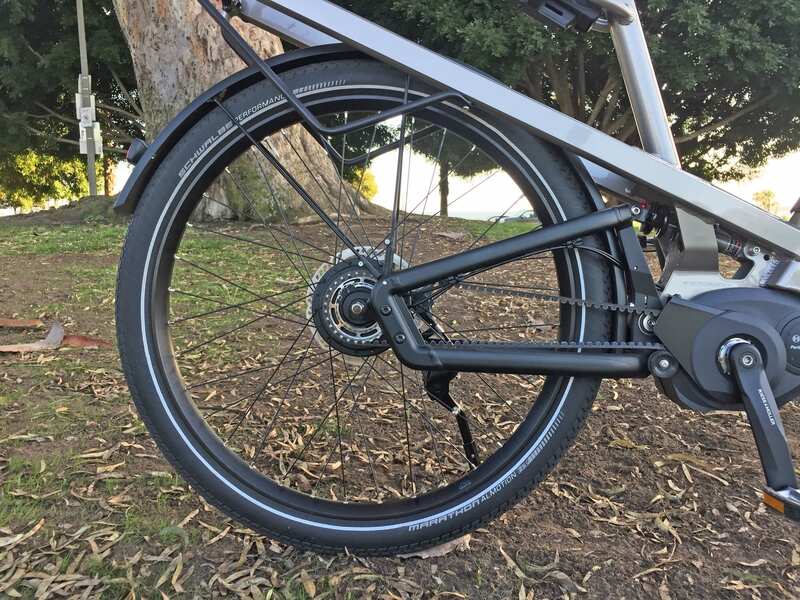 The tires on this bike are slightly narrower, but still wider than a road or city bike, and that increases stability and comfort. 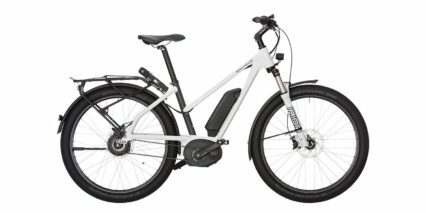 I have noticed that the Enviolo NuVinci hub can feel sluggish at first, and have been told that there’s a ~500 mile break-in period. Given the reliability and usability benefits, I think it’s a great choice. 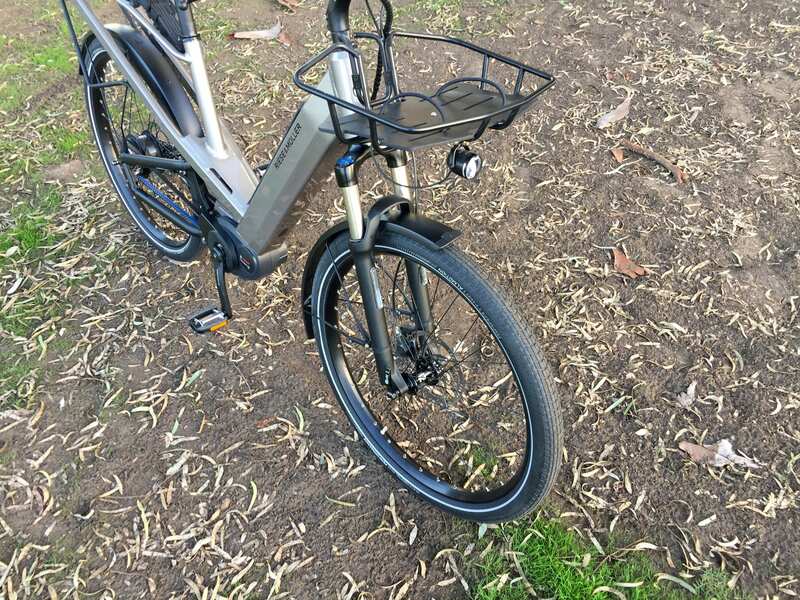 Yes, this ebike weighs more, but it’s much more comfortable to ride than a non-suspended bike (especially in urban environments with imperfect roads). You’ve got a high torque motor, premium brakes, a sturdy frame with multiple sizes for optimal fit, and a great network of dealers to support any aftermarket service and upgrades. 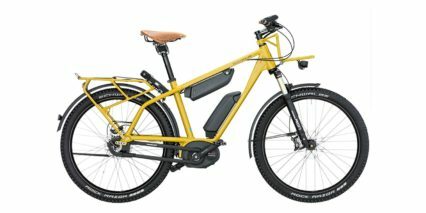 To me, this is a do-anything urban bike that would be perfect for commuting. I’d probably get a dual-battery Homage for touring applications, but I don’t really tour and usually have access to a plug on longer or multi-stop adventures. Bosch does sell a compact charger that puts out 2 amps but takes up less space, and weighs less. 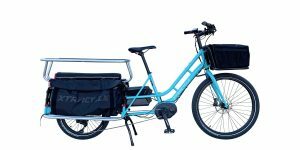 All of the systems here work together to deliver a great ride experience, except for the front basket, which turns as you steer and can dump out cargo when parking. Still, Riese & Müller have specced a BlockLock headset to keep the handlebar and fork from colliding into the main sections of frame. The basket can be removed if you don’t need it, and is only rated to 6.6lbs. For those with a child seat, the front basket could be a great place for jackets, books, groceries, or fluids. Which reminds me, there are no bottle cages present on the downtube or seat tube here. 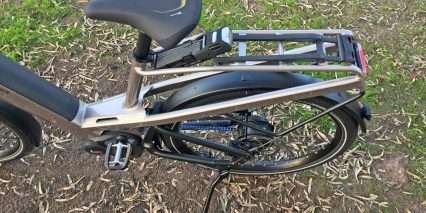 There are some just below the folding lock, but with a moving rear wheel and fender, there’s a chance that a big drop or bump could collide and get crunched. 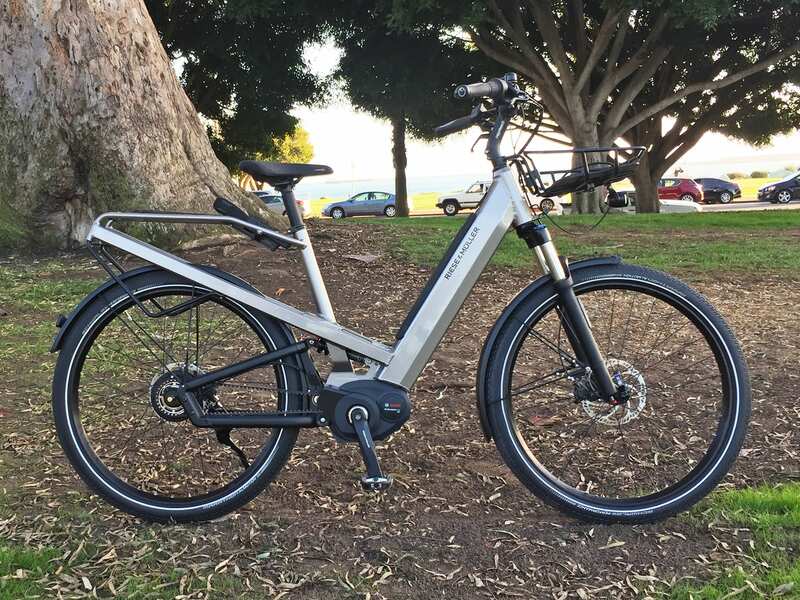 As always, I love to get your feedback in the comments below, and welcome engagement, recommendations, and pictures in the R&M Ebike Forums! Nice review of the Riese & Müller Culture GT Vario, which frame size did you test and what’s your height and about how tall is Chris? My nit picks – wish the high-rise stem was adjustable and bars were not swept back, the tires were bigger such as 2.4 and water bottle mount as you mentioned. 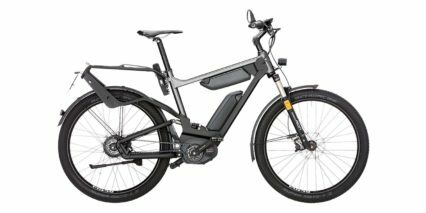 Still appears to be a fantastic new model and one of the very few full-suspension commuter type eBikes on the market.